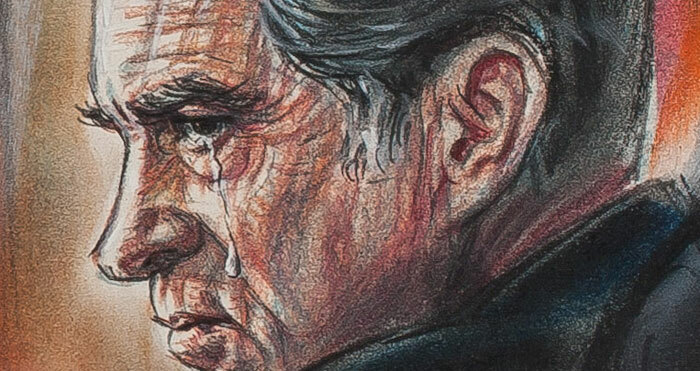 Nixon’s tear, a detail from “Alone in Oval Office” by Freda Reiter, 1974. Will we ever get to see Donald Trump cry? It looks like it’s going to be a hard fall, as Special Counsel Robert Mueller and multiple congressional committees continue their investigations of the president. 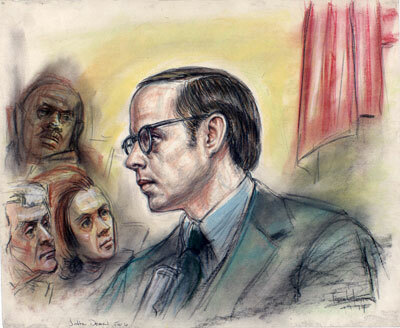 For those of us old enough to remember, the investigations surrounding Watergate may provide a hint of things to come. From the 1973 break-in at the Watergate complex, through President Nixon’s resignation on August 8, 1978, to the 1975 convictions of top White House staff, the prolonged demise of the Nixon administration was an unprecedented media event. 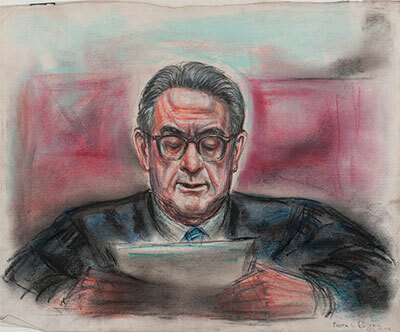 Courtroom artist Freda Reiter covered multiple cases for ABC TV, leaving an impressive artistic record. 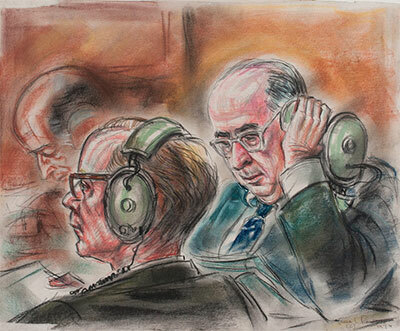 A current online exhibition at Gallery 98, Watergate Courtroom Sketches by Freda L. Reiter, 1973–75, depicts all the heroes and villains in pastel drawings done from life. 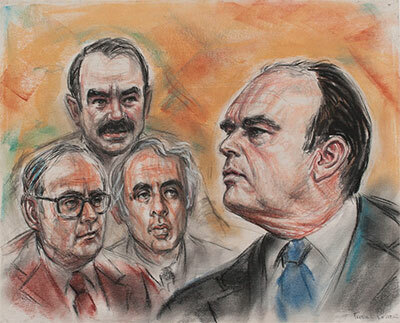 As seen below: White House Assistant John Ehrlichman with Watergate burglars Bernard Barker, G. Gordon Liddy, and Eugenio Martinez (the so-called “White House Plumbers,” convicted along with Ehrlichman on July 12, 1974); Attorney General John Mitchell listens in court to Nixon’s declassified Oval Office recordings; White House Counsel turned prosecution witness John Dean testifies in 1974; Judge John Sirica reads out his verdict in one of several Watergate trials.